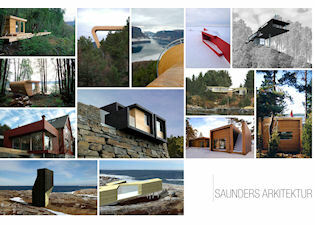 Saunders Architecture is a firm owned by Canadian Todd Saunders who has lived and worked in Norway since 1997. Saunders has worked in countries such Austria, Germany, Russia, and Latvia. The work combines a Nordic design sensibility with environmental concerns. Each project is unique and inventive. Every project has a new process. This strategy derives from an ability to be inventive and to constantly question the purpose of our buildings. Todd Saunders received a Bachelor of Environmental Planning & Design from the Nova Scotia College of Art and Design, Halifax, Canada. While doing his bachelors, Saunders spent a semester as an exchange student at the Rhode Island School of Design, Department of Architecture. He subsequently received a Masters of Architecture from McGill University, Montreal, Canada.